The Portable Markerboard is easily movable with lockable casters and a lightweight aluminum frame. 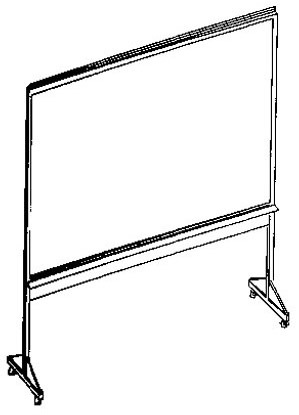 With a write-erasable surface on one side and corkboard on the other, instructors can write, move, and utilize this unit in several capacities. 72”L. X 28”W. X 73”H. Overall. Panel with 1-3/8” wide aluminum frame on all four sides with tan corkboard one side, and write-erasable surface on the opposite side, with a full-length accessory tray. Low glare surface for projection use is white in color and can be used with markers. Assembly furnished with aluminum stabilizer foot having four swivel rubber carpet casters, two having locks.